A major part of a Pharmacy Technicians job, stemming from the handling and administering of prescription medication, is a considerable amount of admin work to keep track of how much of what drug is going where and how often. Technician needs to correlate the drugs with the patient's details and medical history, including things like their weight and any allergies they may have. Thus it's easy to see that a simple thing like keeping track of inventory is hard enough. Only now the job is compounded by patient needs. For this reason, certified pharmacy technicians have to be familiar with certain types of field specific software that can easily manage such a task - and to then perform the necessary data capturing and all that goes with it. Answer questions and explain different drugsYou will have to be overseen by a licensed pharmacist at all times as you perform your duties, and there are a large number of things that you are not allowed to do as a certified pharmacy technician. There are a number of options open to you, however, and many certified pharmacy technicians in fact use this qualification as a stepping stone to achieving greater things and eventually becoming licensed pharmacists themselves. In order to work as a certified pharmacy technician you will have to earn your pharmacy technician certification. The certification you receive will have to be accredited by the Pharmacy Technician Certification Board (PTCB) and the Institute for the Certification of Pharmacy Technicians (ICPT) before you can practice. Below are instructions that you should follow in your pursuit of a certified pharmacy technician qualification. Follow the steps and you won’t go wrong. Where Will You Work As A Certified Pharmacy Technician? And even in some instances, government organizations. Before you can even consider enrolling in a certified pharmacy technician course you will have to determine whether or not you are even eligible to apply. There are a number of steps you can go through in order to determine your eligibility. There are a number of requirements that you will have to meet in order to be eligible to study for a certified pharmacy technician program. You will need, for example, to have a high school diploma, or an equivalent thereof in the form of a GED. If you do not have either of these it is suggested that you work for your high school equivalent before applying to enrol in a certified pharmacy technician program. Another requirement is that you have a crystal clear criminal record. If you have any felonies to your name when you apply for a certified pharmacy technician then you will find that you will not be allowed to enrol. This is a fact of life, so if you have a criminal record you should possibly consider another line of work unless you can justify the record adequately to the school you would like to do your certified pharmacy technician program at. In some cases your felonies will not be taken into account, depending on what they are. However if you have drug-related felonies on your record you will most likely be turned down. This is because a certified pharmacy technician has to work with drugs every day and therefore has to prove that they can be trustworthy with those drugs. The best way to find out what particular requirements there are in your state is to go to your state’s board of pharmacy website and see what the requirements are. There can be huge differences between states, so make sure you know what t do for your particular state. 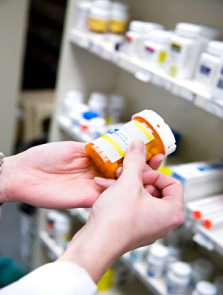 The next thing that you may want to do is to find a certified pharmacy assistant program. This program, as has already been mentioned, absolutely must be accredited by either the Pharmacy Technician Certification Board (PTCB) or the Institute for the Certification of Pharmacy Technicians (ICPT). When you look for a pharmacy technician school you will be able to choose between online classes and face-to-face classes at an institute. There are a number of advantages to each type of program. An online national pharmacy technician certification program is a lot more convenient and allows you to easily study at your own pace and in your own time. If you require to work while you study then this type of certification will make it possible for you to both work and study at the same time. However not everyone is able to handle the stress and self-motivation required for working on your own. Many need the classroom structure. Also an online certified pharmacy technician will not prepare you for the practical side of your career as a pharmacy technician. On the other hand you will receive a lot of hands-on experience in a classroom situation, as well as plenty of guidance and help and the ability to interact easily with other students as well as with your lecturers. Many people need this kind of structure if they are to do well in their certified pharmacy technician qualification. However these pharmacy technician programs are far less flexible and may not allow you to continue your career while you study. Tuition fees: The cost of the program will also affect your ability to attend, but try not to make this your main criterion for selection. Percentage of exam passed candidates from the school in previous years: It is very important that you only attend a program where the students in past years have passed the program adequately and consistently. There are two parts to most courses that you can undergo to become a certified pharmacy technician. The first part will involve theory work and this is what you will be tested on in the examination. It is important that you study this hard and know what you are talking about. The second part of the qualification involves hands-on training. It has been mentioned already that this is not a requirement. However it can help you a lot in terms of your success in the certified pharmacy technician examination. If you have worked in a hands-on situation with the various drugs that you will have to deal with on a daily basis, you will be able to better remember the details when it comes time to answer the exam questions. This kind of experience is the best way possible for you to prepare for the exam as it is a lot easier to remember things if you have actually worked with them. Some employers will only employ those certified pharmacy technician who have taken the time to get the hands-on experience that they see as absolutely necessary for being successful in that line of work. You may in fact improve your career opportunities by getting this kind of experience, and you may be limiting your future options if you don’t. There are a number of places where you can work as an intern, and a number of the certified pharmacy technician training programs referred to above are great places to receive your hands-on training if you are willing to do what it takes. It is suggested that you study for the certified pharmacy technician exam before you register for it. This is because you do not have to prove that you have graduated from a program in order to write the exam. The exam date could be extremely soon, so you want to study before you register for the exam. Make sure that you meet the requirements for the exam. This includes things like how old you have to be and what state your background check must be in. The next step is to create a study plan. To do this it is suggested that you actually purchase study guides that are aimed at helping students prepare for these tests. As you are not required to attend a formal course, these study guides are likely to be your best source of reliable information for the exam. You can also attend courses, as has been mentioned above. Another good way to prepare is to discuss the exam with certified pharmacy technician that have already written and passed it to see what their take on the whole thing is. The study plan that you prepare is essential for helping you get through all of the work that you have to know for the exam. You should be sure to carefully follow all of the steps that you have laid out. It often helps to get a pharmacist to help you create your study plan in the first place so that you can get some inside tips on what areas of the work to concentrate on the most.There are also free practice exams to be found online. Doing practice exams are potentially one of the best ways for you to prepare for the pharmacy technician test. There is nothing better than actually answering exam-like questions in order to get an idea of what is coming. There are a number of documents and other things that you may have to submit if you are hoping to write your certified pharmacy technician exam. The information that you may to present in this instance may differ quite significantly from state to state. This means that you have to do research from the day that you decide to write the exam and become a certified pharmacy technician. You need to be sure that you are fulfilling the requirements for your particular state every step of the way and that you are not wasting your time as you go along. There may be things that only have to be done and submitted in your state particularly, so it is important that you take the time to make sure that you are in line with your state’s requirements. For example you may be required to submit a photograph in one state but not in another. Depending on how strict they are at your examination centre you may then be told that you cannot write the exam if you do not have a photo. You may also have to submit fingerprints. This is quite a common requirement as it is related to the background check that they will do of you to see if you are the right kind of person for a job like this. In some cases these documents and other requirements may only have to be provided once you have passed the test, but it is still better to have them with you when you arrive just in case. Being told you cannot be certified merely because you do not have the documentation required can be devastating so make sure that you are not caught out. Research and prepare properly for the examination. Once you have identified what documentation you need, and once you are certain that you are well prepared for the exam, it is time to actually register to write the examination. You will have to schedule an exam date either online or by telephone. There are two main places that offer an exam of this kind. If you do your exam through the Pharmacy Technician Certification Board (PTCB) you will have to pay a fee of $129 to participate. You will have two hours to complete the exam and the exam will consist of 90 multiple choice questions based on what you have studied. The other body that offers an exam of this kind is the Institute for the Certification of Pharmacy Technicians (ICPT). This exam will cost you only $95 to participate in and has 110 multiple choice questions. However you will also only have two hours to complete this exam. Use this information about the two examining bodies to decide which exam you would like to write. To register for the exam offered by the Institute for the Certification of Pharmacy Technicians (ICPT) you will have to call them and make your payment telephonically or via email. If you take the exam through the Pharmacy Technician Certification Board (PTCB) you will have to register for the exam online and make your payment with your credit card. There are some details that you will have to provide regardless of which of the two exams you choose to write. These things are your full name, date of birth, address and Social Security number. To write the exam or you will need is your identification card. As the exams are both electronically based you will not have to take anything like pens and paper with you to the exam centre. All you will need to do is to prove your identity. Once you have written and passed the exam you will have to register with your state board of pharmacy in order to start actually working as a certified pharmacy technician. To do this you should start by using your search engine to find the website of your state’s board. Another way to get hold of this information is to go to the National Association Boards of Pharmacy website. This website will provide you with the link you need to find the state board website for your particular state. In order to access the National Association Boards of Pharmacy website please go to http://www.nabp.net/. There are a number of different requirements that you will have to meet before you can be registered, so it is important that you find out what these are before applying for registration. Note also that these requirements do tend to vary rather severely from state to state, so it is important that you make absolutely sure that the requirements that you are aiming to fulfill hold true for your state in particular. If you have a state in mind where you would like to work it is very important to make sure that you meet all of the requirements for that particular state. A lot of these states may require you to pass the exam, but not all of them will deem this necessary. Important information like this is why you need to do your research properly and find out well ahead of time what requirements you need to meet in order to become a certified pharmacy technician in your state of choice. Two exams were mentioned previously, but not all states will accept both exams as a basis on which to register you. Therefore you need to know the state requirements before choosing which exam to take. In order to remain certified as a certified pharmacy technician you will have to engage in continuing education. Continuing education comes in the form of extra classes and lessons that you can attend in order to ensure that your qualifications are up to date and that you are aware of any new developments in the drug industry. In most states this is mandatory in order for you to renew your certified pharmacy technician license. However the type of continuing education as well as the number of hours you will need to do varies from state to state so it is important that you once again do some research into the particular requirements for your state. Generally speaking though you will have to complete about 20 hours of additional training each and every year in order to remain certified. Don’t look at this as an annoyance, but rather as something that will help you keep on your toes and be the best certified pharmacy technician that you can be. There are a number of places where you may be able to do this continuing education, including local community colleges or continuing education centers. Look into all of the options in your area and find the most convenient continuing education program to suit you and your needs. If you do not complete the continuing education that is required of you, then you may lose your certified pharmacy technician status. In some cases it may merely be suspended but in others you may lose it altogether. There are complex procedures involved in getting your certification as a certified pharmacy technician back, so this is definitely something that you want to avoid at all costs. If there was no mandatory continuing education for certified pharmacy technicians then the entire industry would deteriorate drastically.